One of the challenges we face today, having so much information at our fingertips, is that important information often gets covered over by newer information. For example, when was the last time you heard something about the conflict in Syria? It’s still going on, but it doesn’t make the news – unless you go looking for it specifically. Of course, some information gets sent to the bottom of the news pile for political reasons, too – sadly. There is one ongoing news story that isn’t getting much attention, for both of these reasons. It’s not new, and it’s not politically correct. It’s the terrible, tragic story of Christians who are being persecuted, extorted, exiled, or killed in northern Iraq, just for being Christians. 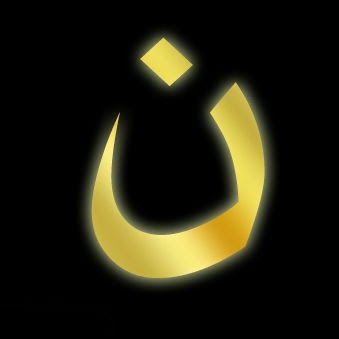 Pictured is the Arabic letter nun (the equivalent of our N). It is being spray-painted on the homes of Christians, standing for “Nazarene”. This labels the homes so that they are known as followers of Jesus, and can thereby be persecuted, extorted, exiled, or killed, just for being Christians. Other than a few who make a point of keeping this in the public eye via social media, it’s not being reported on very widely. But as a follower of Jesus, you need to know about this, so you can, at the very least, pray for those Chaldean believers. There seems to be little the international community is willing to do to help these people, being so severely dealt with by their own countrymen, just for being Christians. Suffering and persecution are not new to the Christian faith. The apostle Paul once wrote to the Romans, “since we are his children, we are his heirs. In fact, together with Christ we are heirs of God’s glory. But if we are to share his glory, we must also share his suffering” (Romans 8.17, NLT). So we can take heart that the faithful of Mosul, who are being persecuted, extorted, exiled or killed for their faith, are following in the way of Christ; perhaps, in certain moments, they do, too. But that cannot stop us from seeking the justice that these believers deserve. What if we were in their shoes? What if it were us who were suffering for our faith? Few of us in the western world truly understand what that’s like. But if we live out our faith in its fullest sense, we will experience some degree of persecution. At the hands of the Islamists, Christians in Iraq are experiencing grave persecution, greater than anything we could imagine. What will we do to aid them? And what will we do to ensure this doesn’t happen where we live? God’s passion, and compassion, for his exiled people seems chivalrous, so we opened the message with this old cartoon clip. Daniel 10.1-11.1 gives Daniel, and us, a demonstration of the spiritual battle that takes place in the cosmos, whether we are aware of it or not. The angel tells Daniel, “You are very precious to God.” So are all of his people! Listen and be encouraged for the battle. On the news the other night, I saw a tragic story about an elderly couple who, in the process of giving away kittens via Kijiji, fell victim to what’s called a “distraction crime”. While one potential kitten owner talked to the couple, that person’s partner went to use the bathroom and stole some valuables from the couple. The good news from the story is that the robbers have been caught, because a vigilant neighbour recorded the unfamiliar vehicle’s licence plate number. Some of the stolen goods have been recovered. That statement broke my heart. I know absolutely nothing about the spiritual lives of any of the people involved, so I will not say anything about how that lady should have responded. But I will say this: I hope that no follower of Jesus would ever say that to anyone else. Ever. Many people harbour bitterness in their hearts. And when a crime has just been committed against you, there is an understandable anger and grief that is experienced. But my hope is that as a Christian, I would never find myself saying to someone who had wronged me, “If I get to heaven, I’d better not see you there.” In fact, my hope is that I would see that person there, as a result of the grace of God pouring out over that person, leading to repentance and forgiveness. People respond to being wronged in various ways. Some respond with anger, even after a long time; they hope, perhaps, that the offender will ‘rot in hell’, or something like that. Others respond with forgiveness and mercy. As Christians, our model is Jesus, who said, even from the heinous pain of the cross, “Father, forgive them, for they don’t know what they are doing” (Luke 23.34, NLT). Think about it: Jesus forgave those who were responsible for his crucifixion, in order that the way would be paved for you and me to be able to be forgiven of our sins – and be free to forgive others their sins. Jesus gave us a dangerous model for prayer when he encouraged us to pray, “…forgive us our sins, as we forgive those who sin against us” (Luke 11.4, NLT). Let’s not harbour bitterness or unforgiveness against those who have wronged us. They take up space in our souls and don’t pay rent. It’s not easy to give those feelings up to God, but we are invited by the Lord to do so. When we surrender our bad feelings and ill will, he will open our hearts to enable us to wish heaven’s joy for those for whom it might otherwise have seemed a long shot. 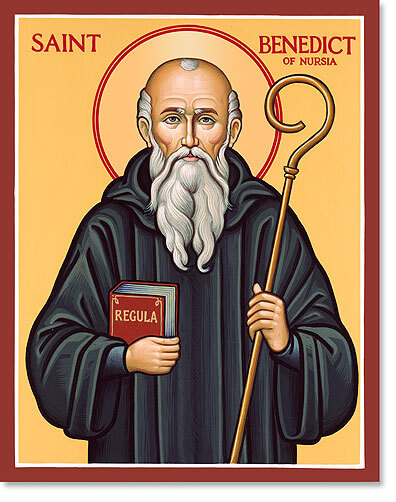 Benedict of Nursia (480-543) is best known as the father of modern monasticism; his feast day, for those who mark such celebrations, is today, July 11. He wrote what has become known as the Rule of Benedict, a lengthy guide for those who seek to live in cloistered community. I could say much about Benedict, but I will limit it to this, for today: Benedict said that for the monk, nothing is to be preferred to what he called “the work of God.” And what is the work of God, for Benedict? In a more involved sense, Benedict referred to the divine office as the work of God, the multiple daily occasions where the monks drop whatever else they’re doing to gather together to pray and sing the Psalms. While each monk is assigned work within the community based on training and gifting, his real work is to pray. Ora et labora is the Benedictine motto: pray and work. Last week, I wrote about patience, and how time spent waiting in line can be used to pray for others – even the people waiting in line near us, whom we may not know. In response, I was asked two excellent questions by a faithful reader of Encouragement From The Word: first, Why would God need or want us to pray for someone we know nothing about? and second, Since God already knows what is best for that individual and we don’t, why would our prayer have any influence on God? I responded by saying that prayer has less to do with us influencing God than it does with developing our relationship with God. I remember when I was getting to know the woman who is now my wife, in those early weeks and months, we talked, whether on the phone or in person, a lot. If you’ve been in a serious relationship, you probably have done the same. We would talk about anything and everything, and it wasn’t about information sharing; it was about relationship building. And on those occasions when we pray for others, whose situations (or maybe even names) we do not know, we commend them to God’s love and care, and let the Lord deal with their individual circumstances. While we may not be able to pray with precision, we can build our relationship with the Lord through such prayers. When I pray with a monastic community (and I do, when time allows), I am not always acquainted with the people or issues that fill their times of prayer. The Psalm chants that we sing are not always familiar to me. But these times, like the times I spent waiting in line and praying for others, help to strengthen my walk with God. And that is never time wasted! How can you redeem time by spending it building up your relationship with God? “Always be joyful. Never stop praying. Be thankful in all circumstances, for this is God’s will for you who belong to Christ Jesus” (1 Thessalonians 5.16-18, NLT). 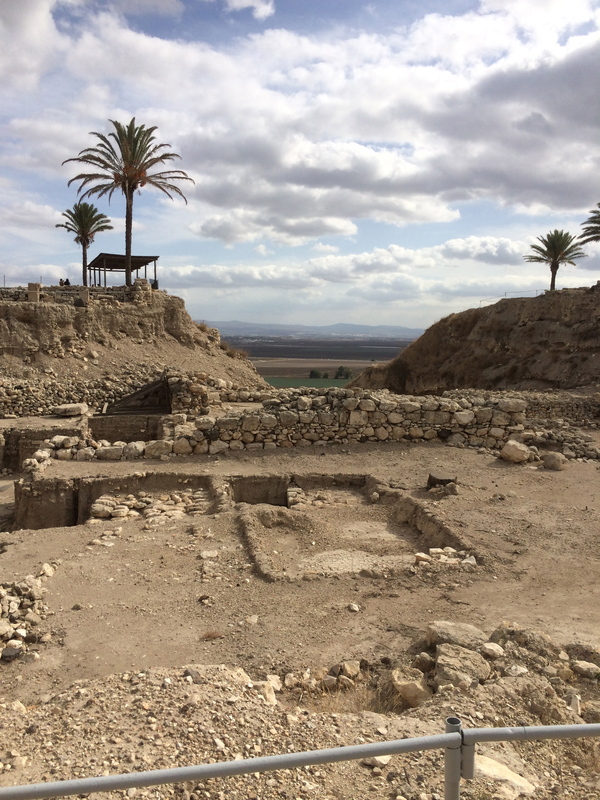 Pictured at right: an archaeological dig at Megiddo, taken November 2013.